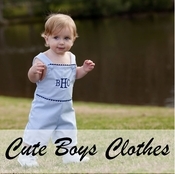 We carry a myriad of adorable and personalized baby clothes gifts for your perusal. Far from average, we stock only the finest quality outfits and gift sets with unique themes and detailing. In addition, you�ll see some exclusive coordinated clothing ensembles with outfits, blankets and accessories as well as American made bath robes and towels with the baby�s name embroidered for a thoughtful gift choice that becomes a lasting childhood keepsake. Need help deciding? Send us an email or give us a call and we can help you select the perfect bestowal for the new baby girl or boy.